After a week’s worth of heavy Thanksgiving leftovers, I was craving something lighter than the remaining sweet potatoes and quinoa I’ve been chipping away at. It’s no secret that I love potatoes (particularly the sweet potato variety) but I was tired of eating the same thing. However, if you are an unconditional potato lover, my Sweet Potato Scallion Pancakes are worth the extra work for something different. Fried in sesame oil paired and paired with a Jalapeno Crema, these not so traditional latkes will hit the spot. This recipe is definitely not a traditional “winter” meal. It’s made of a wild and long grain rice medley, chickpeas, avocado, arugula, spinach, and shallot with a lemon tahini dressing. I wanted something refreshing to eat during a season of savory flavors. If you’re looking for a more savory, hearty meal you should try my Coconut Curry Noodles with Crispy Sesame Tofu - it’s so warming and comforting, perfect for a cold winter night. This salad is meant to be more of an appetizer than a main dish. It’s light and just filling enough but if you wanted to bulk it up I’d recommend adding hemp or pumpkin seeds, cucumber, a hard boiled egg, and/or nutritional yeast. Tofu would also be a delicious meat-free protein for bulking up this salad. I’d recommend tossing it in poultry seasonings and pan frying until crisp and slightly golden. If you’re a meat eater, I’d recommend adding grilled chicken, shrimp. or salmon for extra protein while still keeping the meal overall lean. If you’re feeling extra fancy, scallops would also be a great option to step this dish up! If you’re lazy (no judgement) and don’t want to cook rice from scratch, I highly recommend Seeds of Change Organic Quinoa & Brown Rice with Garlic as a quicker alternative. I keep these packages on hand pretty regularly in my pantry for my own lazy evenings or when I’m pressed for time. If you’re using the Seeds of Change rice, skip ahead to Step 2. Boil the 2 1/2 cups of water in a medium pot. Once boiling, add the tsp of vegan butter allowing to melt, then adding the wild rice medley of choice. Bring to a boil again and cover, stirring occasionally. Preheat your oven to 400 degrees. Toss the drained and dried chickpeas in 1 1/2 tsp of garlic salt and place on a lined baking sheet. Once the oven is heated, place the chickpeas in the oven and set a timer for 15 minutes. While the chickpeas are roasting, prepare the dressing by combining all the ingredients in a small dish or jar, mixing with a fork until everything is smooth and well incorporated. Check on the rice, stirring to prevent burning. The rice and chickpeas should finish cooking around the same time. Once both are done, remove the chickpeas from the oven and the rice from the heat. 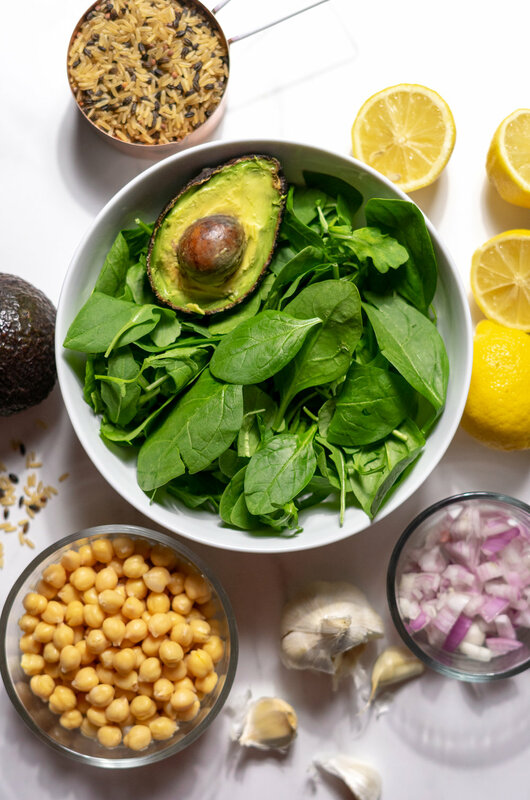 In a large bowl, add the arugula, spinach, cubed avocado, chopped shallot, and chickpeas. Add the rice over the leafy greens, gently tossing together so they become warmed and slightly wilted. Add the dressing over the combined rice, chickpeas and leaves, gently tossing again until everything is evenly coated. Serve immediately!